If you came here for Colored Light, start reading over here to see how far I've gotten! If you're looking for something for 1.7+, Take a look at this for an updated resource pack! We all seem to like it, and now it can be yours! So, I've created my own colored glass mod, borrowing from some great ideas from the community! The Colors are quite different as well. *This picture does not use the CTM renderer... do we have any creative builders who want to showcase a sweet picture up here using the mod? Post your pictures in the topic! Place 6 colored glass into a crafting square to obtain 16 colored glass panes... Just like normal glass! NOTE: I backported the recent changes to the 1.6.2 mod. If you want to use CTM with MCPatcher, you can now! 1.6.4.103 - Render Continuity fixes, brought the light values of panes down to match blocks. 1.6.4.101 - Added Connected Texture Support! Re-added The Easy Recipe Config... Oops. Currently, there are no connected Texture resources within the mod, expect to see some soon. Feel free to download some of the connected textures within the forum post on pages 3 and 4. If you want to use Connected Textures, be sure to install MCPatcher! 1.6.4.100 - Updated mod to Minecraft version 1.6.4... this will require you to update Forge as well! 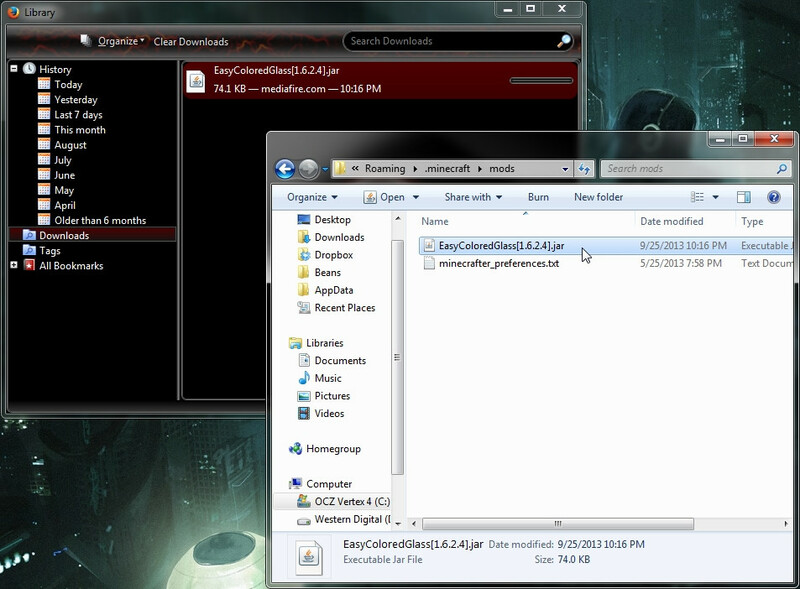 Code was organized, and the mod was repackaged for easier installation! Colored Sand Extends blockSand, rather than block. - If updating from a previous version, make sure to install the new version, and then run it first. IMPORTANT: If you do not run it first, the config file will not change. - Changing the value of Easy Recipes to true will enable the cheaper recipes. Make sure to install Forge first! 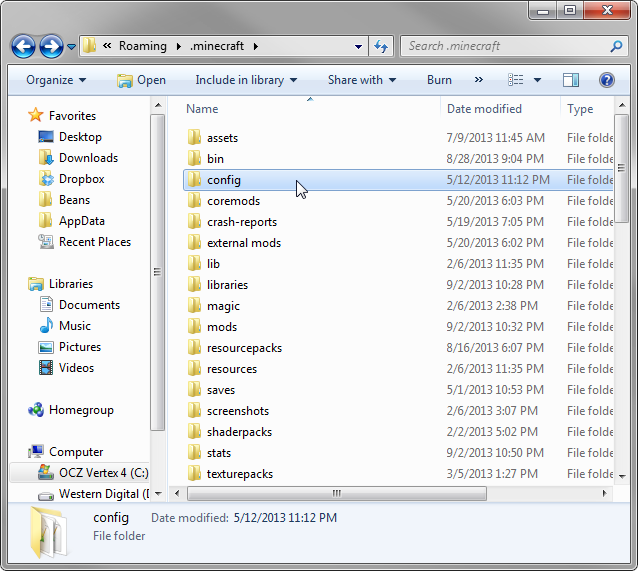 Place the mod in your Mods Folder, in the .minecraft folder. 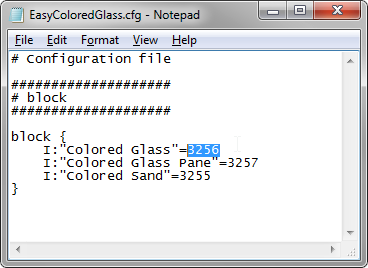 Note: The EasyColoredGlass.cfg File contains editable Block ID's for all blocks contained within the mod. If anyone wants to support the mod here, You can copy this into your signature! Want Some Colored Glass for [1.6.4]? - xXTerra-BranfordXx has been a huge help in getting the CTM textures going. You can thank Terra for the beautiful blending glass panes when you use the CTM renderer! (As well as letting me know that there even WAS a CTM renderer out there to use!) 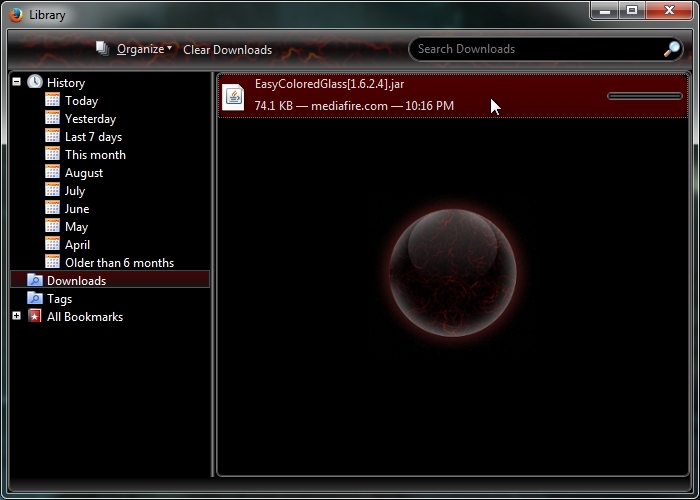 Make sure to check out the resource packs for colored glass in case you want to change their appearance from default! You should check this out. You may have noticed that I linked to that thread as inspiration. You may also notice that after reading through 139+ pages, it hasn't been done well, if at all. This is a feeble attempt at trying out their ideas. I'll take another look at colored lights soon, but I remember it being a far stretched goal. Will there also be an option to make colored glass through the cauldron aswell, as an idea from the thread, or is it only going to be through direct crafting of sand and dyes? This idea has a lot of cool implications. Namely... cauldrons could actually do something! I however decided that I wasn't going to utilize cauldrons in this manner. When I created EasyColoredGlass, my goal was to create a mod that felt like vanilla Minecraft. If you look at colored dyes, wool, and even clay, you'll notice that Mojang has made it very easy to create colored/aesthetic blocks. If you want colored wool, you take wool, and color it. If you want colored clay, you smelt the clay, and then color it. The results are instant, and require very little effort or resources. I feel that an aesthetic block like colored Glass and Sand should behave like Mojang did it themselves. If Mojang changes how dyed blocks are created, then I will follow. The cauldron idea is fantastic, and I would say that I might enjoy actually using a cauldron for once, however I don't want to start down a path where the mod starts to feel drastically different from the vanilla Minecraft experience that we are all used to. Lol I want this, installing now. Really, I don't understand why Mojang put colored glass in that fake April Fool's Minecraft 2.0 and didn't put it in Minecraft 1.6. Wha? The Fine Print -----> I'm kinda sure there is an obvious reason for this, and that I'm just too dumb to realize it. It's been 3 years, but I'm back, baby! Modpack shenanigans underway. I don't play Minecraft nearly as much as I used to. 2019 is scary. Here to provide any technical help I can! Find me on Steam. I play Rimworld, EU4, Civ 5, and Left 4 Dead 2! If you find my work helpful, feel free to leave a like. Wow, CptSpaceToaster! That looks fantastic! I have seen other colored glass mods but the one problem I had with them (including the 2.0 April fools update) is that all the colors were "weak" and faded looking. This mod however, looks a LOT more like how I imagined colored glass to be; vibrant rich colors int he glass. great work!. now do you think you could tackle colored light? -_^ If you can, it would be indisputable proof to Mojang that it is indeed possible. Hey no problem. Forge has this GREAT thing called a Config File. This lets any users change the Block Id's to WHATEVER they want. 1.) Navigate to your .minecraft folder... Hopefully you know how to get here if you're using forge. 5.) Save, close, and start up Minecraft! You ever look through ice, only to notice that you can't see water behind it? Ever look through water, only to find that Ice disappears behind it? This problem is referred to as "z buffering" as Minecraft will NOT render "transparent" blocks that are behind other "transparent" blocks. One sad problem that you'll notice is that the colored windows make other colored windows, water, ice, and nether portals behind them disappear as they are all "transparent"
What really messes with this thought is that other clear windows (regular glass) are considered to be "solid", not transparent. (Long story) But when you look through a glass window, you still see water, ice and nether portals behind. 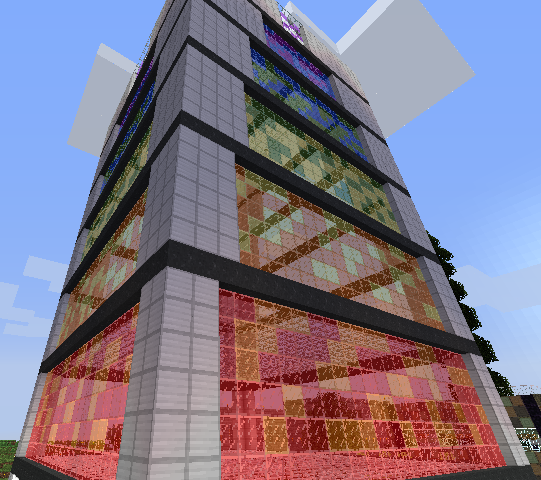 The BIG point is that Mojang thinks that colored glass kinda looks ugly, and unprofessional. They will not officially release colored glass until they can solve the rendering issue in the code. A question, does this have coloured lighting as well? Like if there was a glowstone behind some, let's say, blue glass, will it give out blue light? 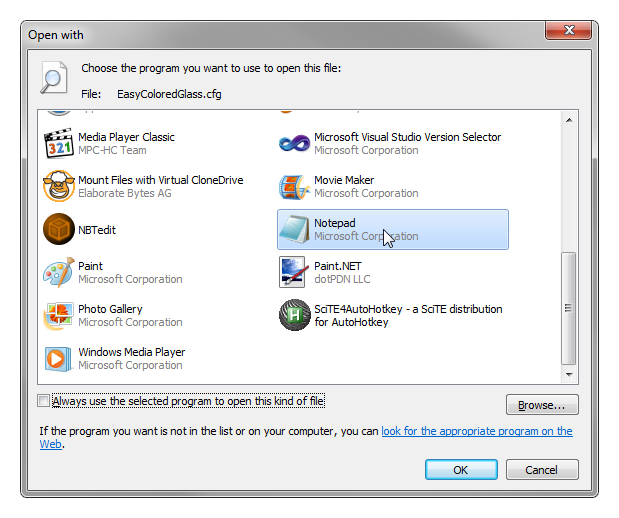 If you are getting "class not found" errors, then you may have not installed correctly. Try reinstalling (follow the posted directions) and let me know how it goes. If you still have issues, then post IN DETAIL how you are going about installing this mod. This thought sounds incredibly appealing. While it may be possible, it would require a lot of hours of coding. In addition, many have speculated whether or not this will run with any sort of decency, vs lagging the machine. All I can say for now is that I'm taking a look at that idea, but have no clue if I'm going to get there. This mechanic has been discussed for a long time, but not really implemented in game/or any updated mods made for it. Hello! I thought this was a great idea so I wanted to show this off to the world. Here is a spotlight for your mod. Pick some more obscure ID's for the glass; they intersect with another mod of mine.